The longer you stay, the more you save at Hong Kong Disneyland Resort Hotels! Official Website Exclusive! Book your hotel stay online to receive exclusive privileges-room upgrade and complimentary drink. One free gift and three HK$10 discount vouchers for spending at any hotel merchandise store. *Discount vouchers are not applicable and will not be distributed for check-in dates during December 21-31, 2018. Get your 2-Day Ticket at HK$699 (Just HK$80 more over a 1-Day Ticket) with HK$30 merchandise discount voucher. 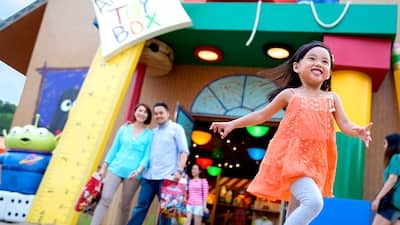 Simply select Hong Kong Disneyland “2-Day Fun” Special Package from “Add-on Options” when booking you hotel stay. The bigger-than-ever Easter Magicarnival will be held across Disneyland Resort’s 3 hotels within 19-28, April, 2019! With over 30 exciting themed activities, Young guests aged 2-6 will especially enamored with Disney themed bouncy castles, mini electric cars, this year there are over 10 new activities including large-scale inflatables: archery game, sport challenges, maze and a lot more! You can’t miss the arts-and-crafts workshop and performances, plus character appearances from some of your favorite Disney Friends. You’re sure to feel excited this Easter! Simply select Easter Magicarnival Ticket from “Add-on Options” when booking you hotel stay. Download the official Hong Kong Disneyland mobile app to find what you’re looking for at the resort with GPS-enabled maps that show your location, browse restaurant opening hours, make dining reservations and hotel recreational activities. Plan your park visit with wait times, character greeting locations and times, show schedule and much more.